As the brainchild of three best friends, Pizza Rock is an upbeat and electric combination of nightlife and unique pizza. This is the place to go in Las Vegas for anyone who wants to experience something a little different when it comes to their pizza. 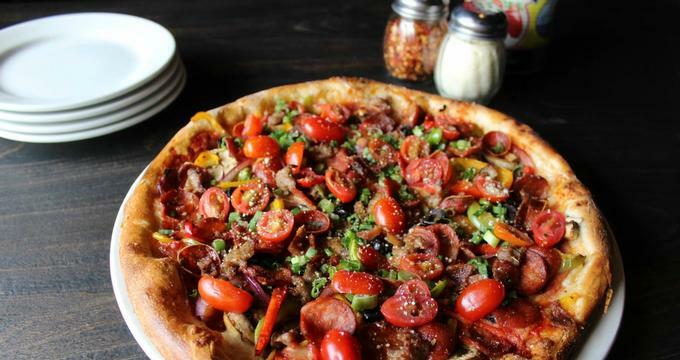 From traditional pizzas to gourmet pies, Pizza Rock always has something available to entice the taste buds. In addition to offering an assortment of pizzas, a wide variety of authentic Italian dishes are also served up, using only the freshest ingredients, and many of the items such as the pasta are handmade on site. All of this delicious food is served in an electrifying environment with a wide variety of craft beers on tap and in bottles and cans for everyone to enjoy. Pizza Rock is a place where you can sit back, chill, eat good food, and enjoy good company. Reservations can be made online for Pizza Rock via OpenTable. Pizza Rock’s gourmet pizzas and Italian and American cuisine can be ordered online for delivery via BiteSquad. Enjoy a semi-private dining experience at Pizza Rock via Tony's Table. Tony's Table is the private dining option offered to guests for parties of 15 or more people. This semi-private dining experience allows Pizza Rock to provide its guests with an authentic Italian dining experience where everyone gathers together to enjoy authentic Italian food. Tony's Table is only available via reservations. Guests who are interested in this private dining experience can contact Pizza Rock directly at (702) 385-0838. Pizza Rock is the place to be for anyone who enjoys good pizza with tons of fun, exciting events. From Football Brunches to Wino Wednesday, there's always something exciting to get involved in at Pizza Rock. Guests can find out more information about the upcoming events at Pizza Rock by visiting the restaurant's website or by staying connected via social media via Facebook, Twitter, or Instagram. Pizza Rock gift cards are available for purchase via the Pizza Rock website. Validated parking is available for guests across the street from Pizza Rock at Downtown Grand Hotel.